This is a post I wrote for Bothwell Community Garden’s blog a couple of years ago. The garden have since made the decision to create a new website and chose not to transfer across many of my pieces from the blog as they felt they weren’t relevant enough to the garden; but I get asked a lot about companion planting a lot, so thought it might be worth adding to my personal blog in case anyone needs a bit of help growing without chemicals and making the most of nature’s own partnerships. Did you have resounding success in the past with certain crops without doing anything ‘special’? Did others fail, but you didn’t know why? Companion planting could be the answer. Plants have always lived side by side; and sometimes they have benefited from this partnership. Sometimes it hasn’t worked out quite so well. 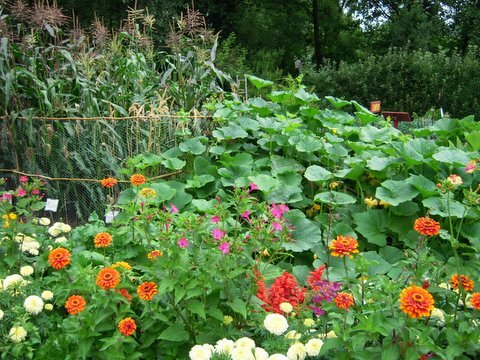 Companion planting involves growing a combination of plants that are of mutual benefit. Some have obvious benefits – growing carrots next to members of the allium family (onions, leeks, garlic etc) confuses and deters both the onion and the carrot root fly because the plants are so strongly scented. Herbs also have their uses – tarragon repels pests and is said to improve the flavour of most vegetables. Here is a brief guide to companion planting – wherever possible, ‘bad matches’ should be planted as far away from each other as is feasible within your raised bed. *If you are growing mint, please grow it in a submerged pot in your bed, unless you fancy a raised bed full of rampant mint!